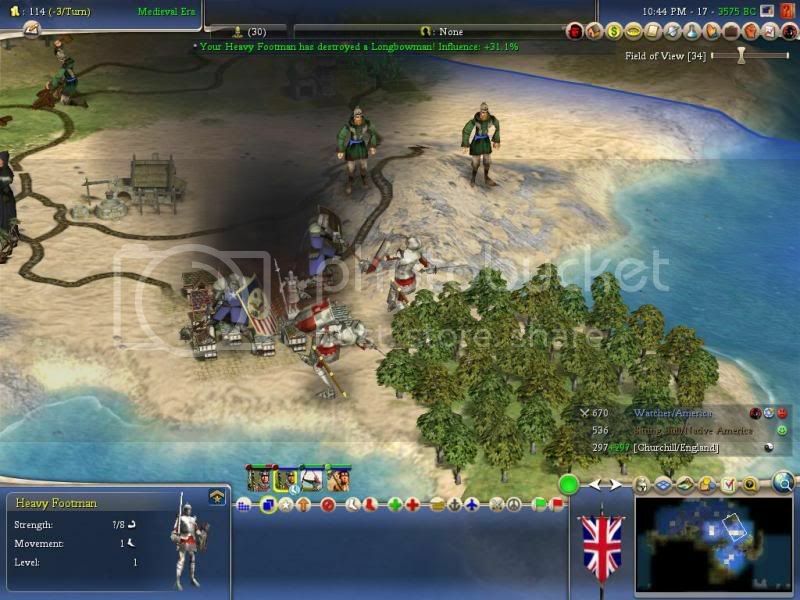 Discussion in 'Civ4 - Modpacks' started by phungus420, Apr 28, 2009. The Goal of Legends of Revolution is to simulate a "commercially viable" expansion pack. What makes LoR unique is the attention to detail throughout the mod, and it's unprecedented stability. Revolutions: Cities that become disenchanted with their empire's rule for various reasons (religious, economic, distance from your capitol -effected by communication technologies and trade networks) can rebel; spawning new civilizations and bringing about civil wars. Barbarian Civ: Barbarian cities that develop high culture or get large may settle down, spawning entire new civilizations. DCM battle mechanics: Ranged bombarding, fighter engaging, building bombing, among others. Inquisitions: After discovering Theology, certain civics will allow the training of inquisitor units which can purge unwanted religions from an empire's cities, and their vassals (if the vassal as well is running the proper civics and has the same state religion as it's master). Super Spies: Spies may gain promotions to become more successful conducting espionage. Tech Diffusion: Civilizations (particularly those that trade and are far behind) get beakers diffused to them from more advanced civilizations for technologies the more advanced civilization has researched. Start as Minor Tribes: Simulates the chaos of early history. 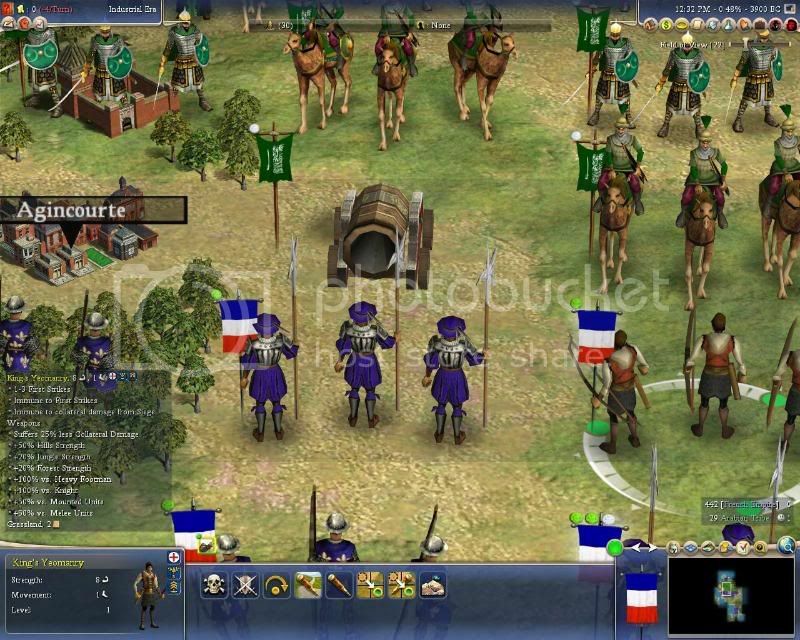 All civs are treated by the game as barbarian (Unit color, flags and borders still show, you are aware of who is around you, they just cannot be peacefully interacted with) until they discover the technology of Writing, and may engage in diplomacy with other civilizations that have discovered writing. Influence Driven War: Battles have an effect on the cultural depth of tiles. This means that in war the borders of empires become dynamic, and will shift according to those who succeed in their war. Limited Religions: Turning this game option on makes it so that a civilization may not found a new religion if they already control a holy city. Allowing other civilizations to found these religions. Better Unaltered Gamplay (BUG): The BUG mod is fully incorporated into the RevolutionDCM core. The enhancements to the interface are too numerous to count. If you haven't tried BUG you will be blown away by how much easier it is to get information, and how well everything is displayed. Better AI: The current version of BBAI has been fully incorporated into the RevDCM core, and the AI is much smarter. Ruthless AI: This game option is similar to "Aggressive AI" but is more extreme and attempts to remove most role playing from the AI's gameplay, making it play to win at all costs. 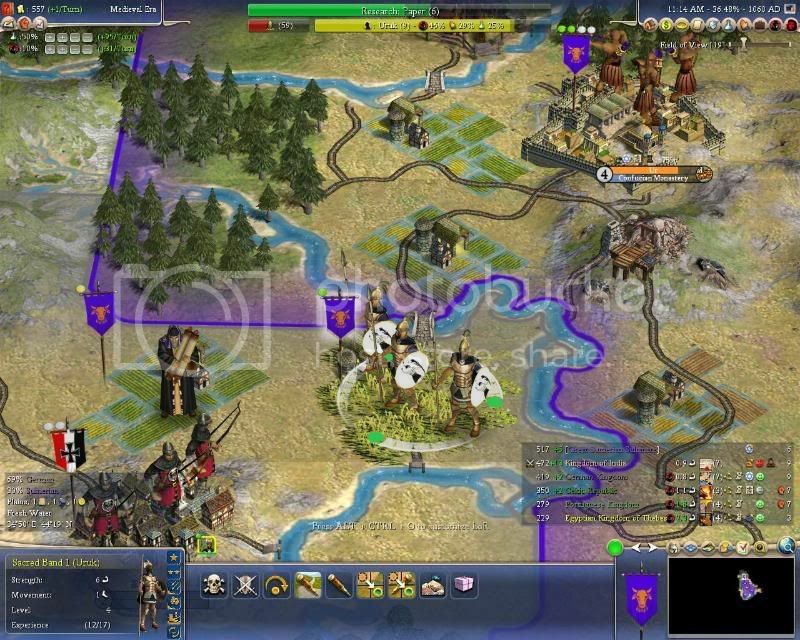 All new features optional: In keeping with the Civilization experience as produced by Firaxis all features in this mod (except BetterAI) can be toggled on and off to your preferences, so that you can set up the game to play as you like. 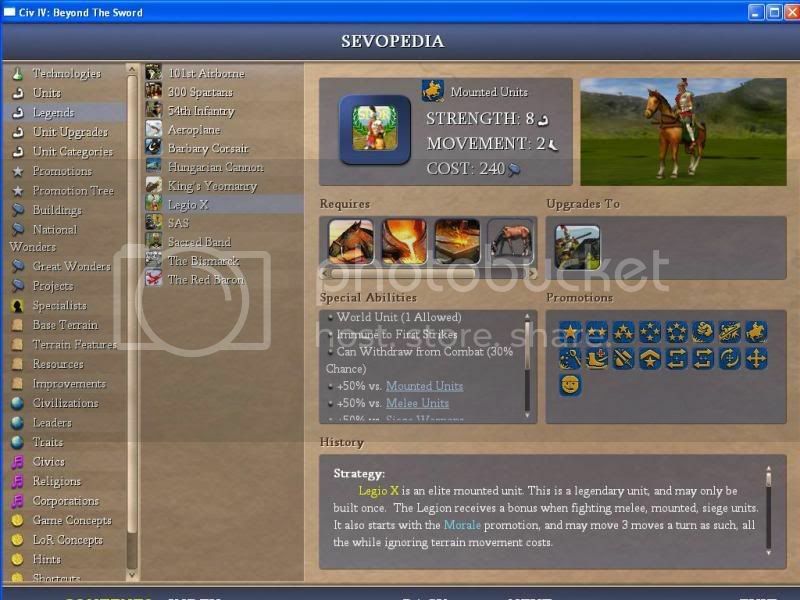 Legendary units: Legendary Units are special units much like world wonders. Use these to spearhead an attack, or be a stonewall defender, perfect for warmongering, or even defending for a builder type player. Legends can be turned off in the game options. 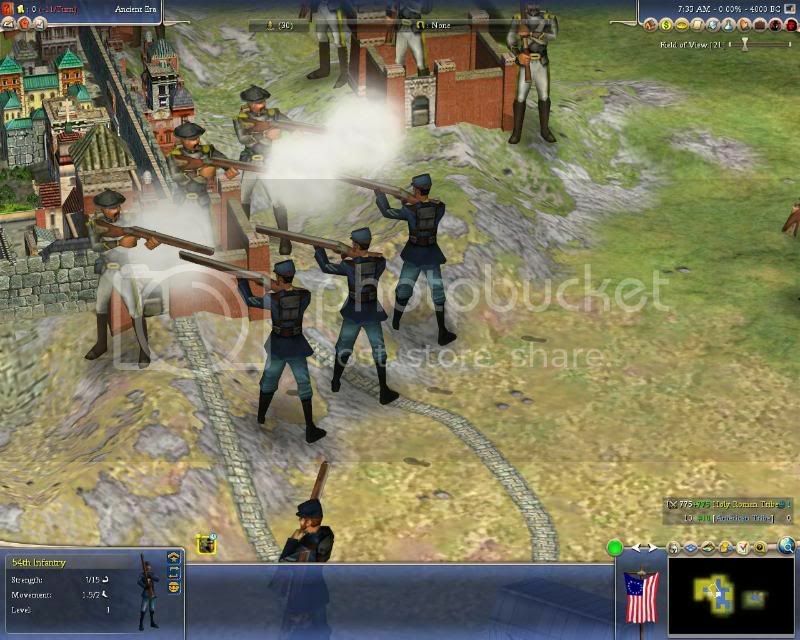 Enhanced Unit and Tech Progression: Legends of Revolution is designed to play as an expansion pack, it adds about as many units and technologies as BtS did to vanilla Civilization IV. 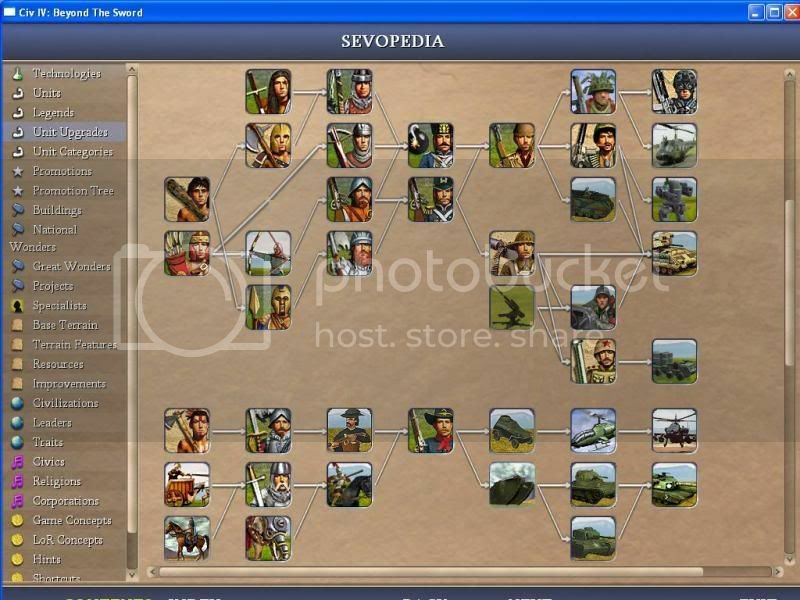 All added units are coherent, have unique buttons and art, and fit in the game seamlessly. It simply makes more sense to go from Wooden ships to the Ironclad Cruisers of the 19th century, instead of the jump from 16th Century sailing vessels to WWII style destroyers as occurred in BtS. 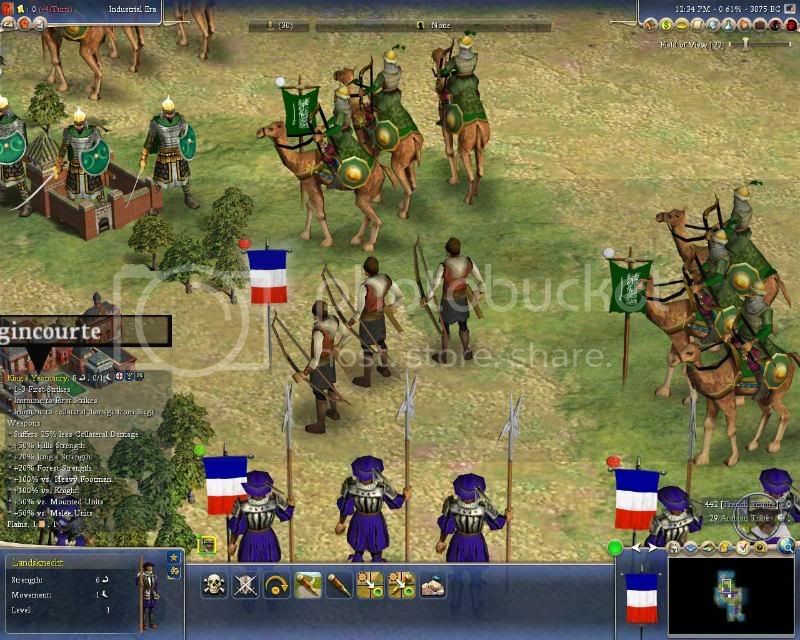 Ethnic Unit and City art: Much of the Ethnic art from Avain's Variates Delectat mod, and Geomodders Ethnic City scapes has been incorporated in Legends of Revolution, the game simply looks much prettier. 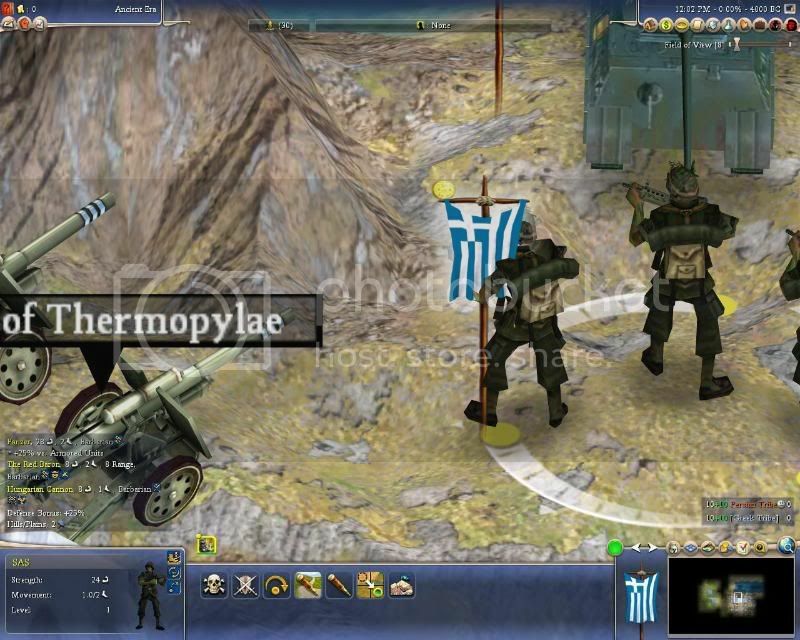 AchillesZero, the art director for this project worked tirelessly to assure all unit models are in line with Firaxis's performance standards, meaning this art has been added with Form and Function in mind. 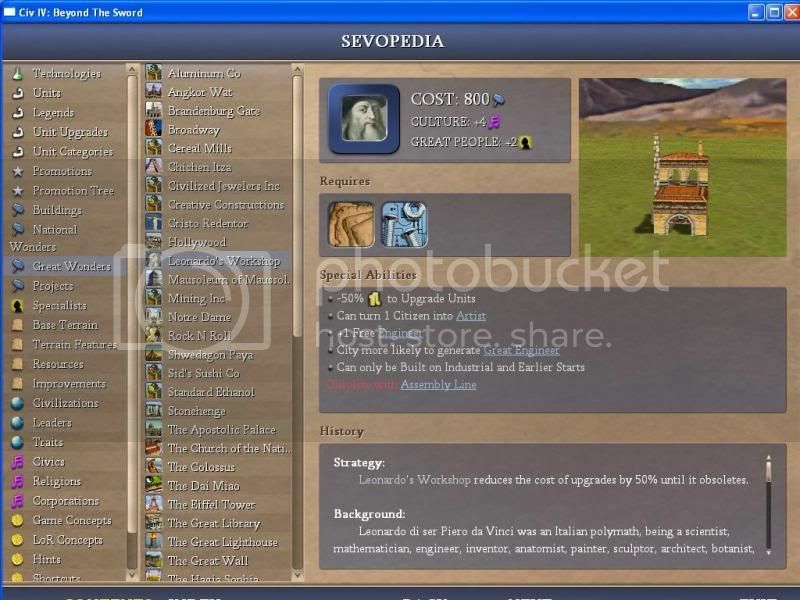 Dynamic Religious Spreading: This option, toggled in the RevDCM tab in the BUG interface supercedes the basic Religious spreading logic in BtS, allowing newer religions a chance to catch up in the world, and keeping the early religions like Hinduism and Buddism from dominating as occurs in base BtS. 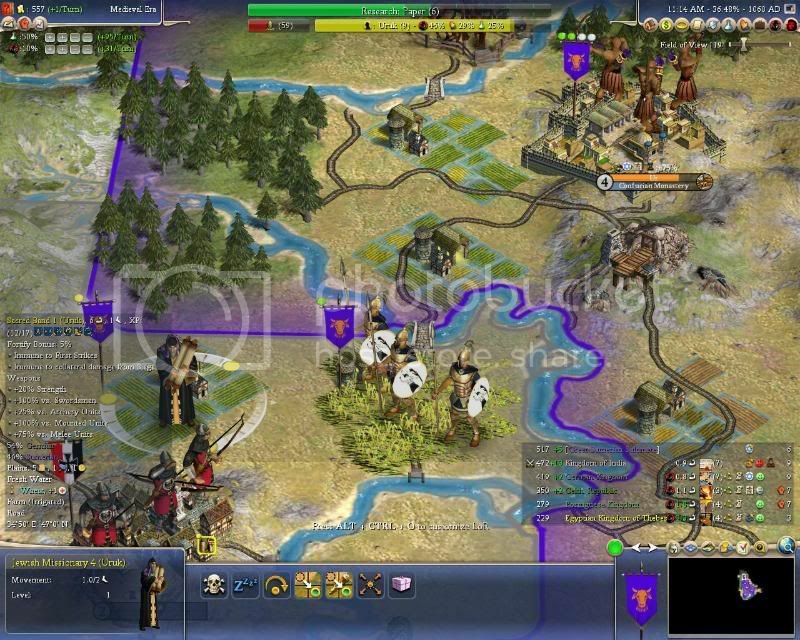 New Leaders and Civilizations: New leaders have been added, all using high quality leaderhead art, as well as the civilizations of Vietnam, the Iroquois, and Sioux. 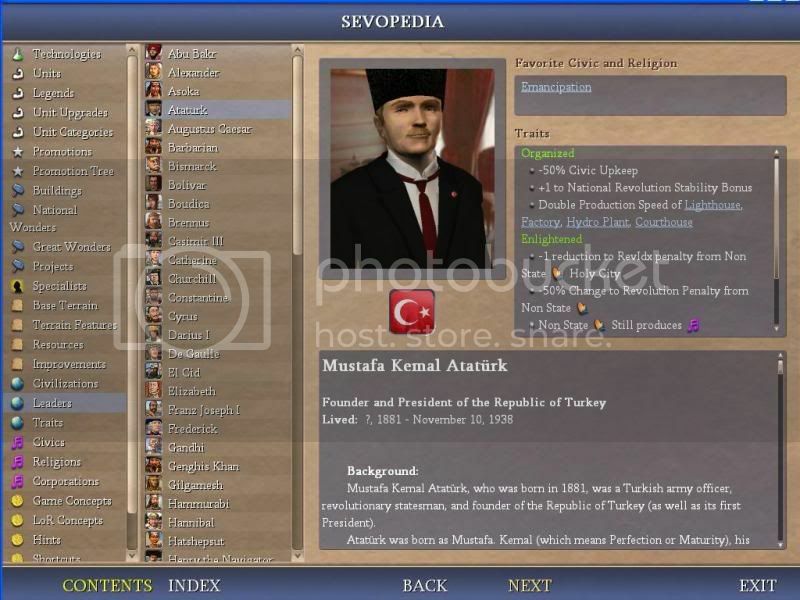 All new leaders have their own unique diplomacy text and diplomatic music, as would occur with Firaxis released content. Attention to detail through all parts of the mod: Legends of Revolution is designed to look and play like a commercially viable expansion pack. As such I have devoted much time and energy to ensure all added content comes with it's unique art, such as unique buttons and models. 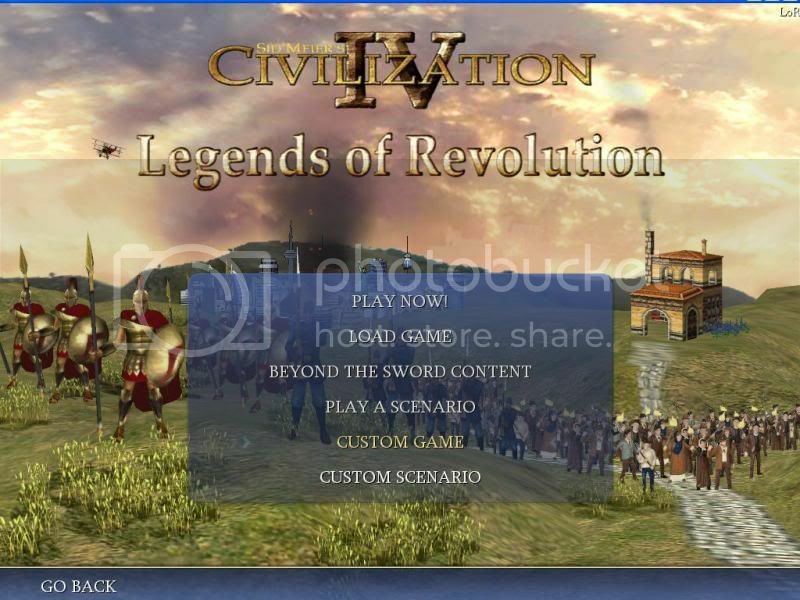 To this day Legends of Revolution is the only mod with a 3D title screen, and this type of detail is found throughout all parts of the mod. All languages are supported, and Finish has been added, German and Spanish are nearly fully translated (If you want to help out this project translations for French and Italian would be awesome). All art is high quality and looks professionally done, thanks to the various artists here on Civfanatics (see credits below), and all units have been checked and optimize to ensure that they are not only aesthetically pleasing, but also function performance wise (many large mods add very system demanding models and art, which is a common cause of reported MAF crashes). Thanks for checking out Legends of Revolution. Feel free to provide any feedback. 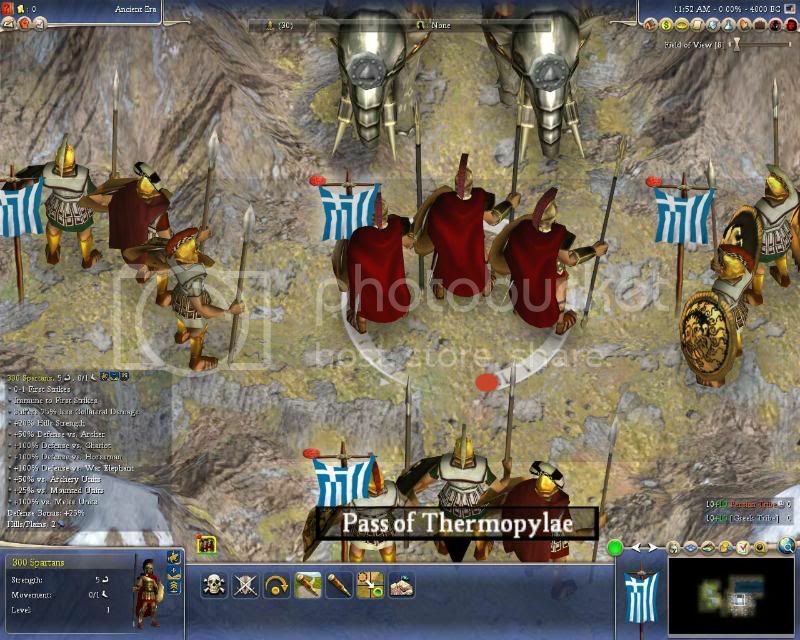 If you enjoy this mod, please rate it and let your friends who play Civilization IV know about it. I taught myself how to Code C++, and much more in order to produce it and have spent thousands of hours on this project as well as the RevolutionDCM core. It is my hobby, and I am happy sharing this work with other civfanatics, my only hope is that players enjoy it. Feel free to use anything in Legends of Revolution on your own projects. When installing you can set the installer to also install the source code to work with. My only request is that if you use my work, please give me credit. Do not PM me with questions about modding. I will not answer. If you want help with something, start a thread on it, or post in a related existing thread. 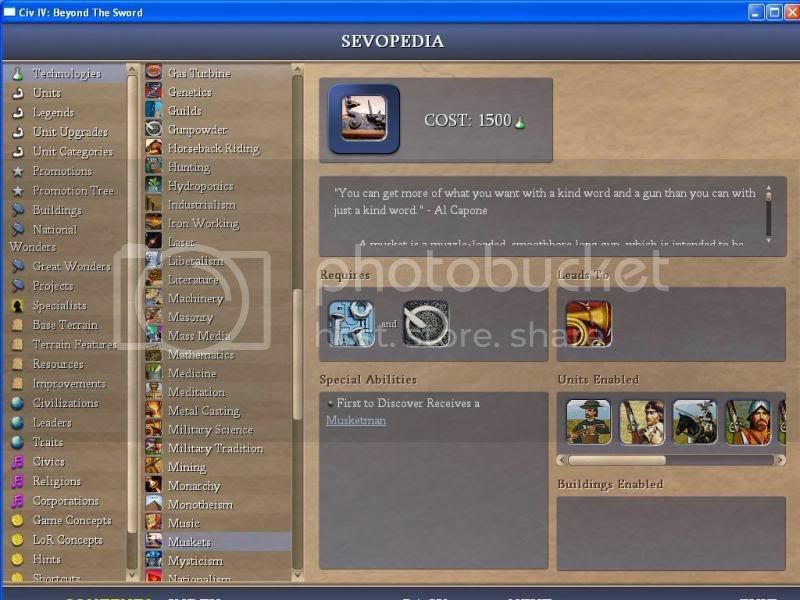 Q: I know I patched BtS, why wol't the installer let me install this mod? A: The installer is correct, your copy of BtS is not patched to 3.19. Probably what has happened is you have used the in game automatic updater; this thing often fails, then lies to the user and tells them that BtS has been patched when it has not! You need to install the patch manually; you can find the patch here on Civfanatics in the downloads section, also the installer gives you a link that will automatically download the patch from Firaxis's website. Q: Can I play LoR in multiplayer? A: LoR 0.9.9 works in MP. However we the RevDCM team are not able to put in as much work on Multiplayer as we'd like. While the game runs flawlessly in Single Player, and we have fixed all known issues with Multiplayer in the last update to the RevDCM core, there may be some sync issues that occur. If you play Multiplayer, and experience issues, please let us know in the RevolutionDCM development thread, with a description of what occurs and give us a save file to check out. There simply has not been enough feedback, and I am unable to test RevolutionDCM or LoR in multiplayer to know if it is fully functional, though I know it is functional. One major note though, to play Multiplayer games, you must have your custom assets folder cleared of all files, otherwise it will break. Q: Why do you call this an unofficial expansion pack, aren't there a lot of those? A: Sort of. The goal of this mod is not to add content for contents sake. 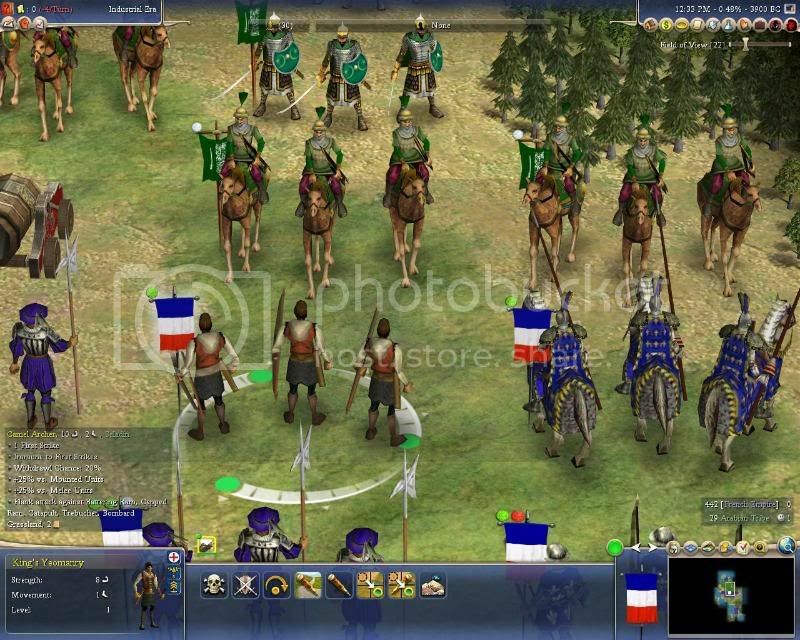 Most of the expansion based mods are filled with lots of things, dozens of new leaders, civs, units, etc. This Mod definitively adds a couple of these things, but they are tempered. The additions are in line with what you'd see in a commercially available expansion pack. Further this mod is very stable, there are no known bugs in it. And finally it includes all the known common sense modcomps that have been created by the community, such as BUG, and Better AI. Q: I downloaded this mod before, and saw there was an update, so I downloaded it and installed. When I updated to the new version diplomacy texts stop working, I can't interact with other civs at all (or any other bug noticed right after updating to a new version)? A: You have windows 7, and the security settings are set to be crazy and overprotective. Not much I can do here from my end, and having your Windows 7 security protocols set that high is going to break other software on your computer when you update. Basically alot of software, including this mod, is set up so that it's installer checks for any previous versions of itself when running, if a previous version is detected the installer will execute the uninstaller for the software so that the old version is completely removed and there are no errant files left over that cause issues with the update. Unfortunately if Windows 7 has it's security settings selected to be a fascist it blocks the uninstaller from actually doing anything, yet it allows it to execute, basically lying to the user and making them think everything is working right. Then when the installer runs and installs the files from the new version, all the old errant files that aren't directly overwritten are still around and breaks the update. This will definitely happen with LoR and will occur for other software applications. For LoR you can get around this by running LoR's uninstaller manually before updating, so that the old version is completely removed, rather then relying on the installer to auto-execute it. Also you should consider toning down your Windows 7 security settings to be more sane. Q: The art looks all messed up, I mean really bad, there are multiple unit models, and they switch to new ones, and the buttons are all blurry, and even though I run the game in frozen animations mode some models like the worker still animate. What's a matter with the unit art? A: The main mod cannot be run in frozen animation mode. The Ethnic art just wol't work in the frozen mode. You must turn animations on for this mod to work correctly in the full mod. Q: Does this mod run slower then standard BtS, I hear that happens with alot of big mods? A: Firstly, this mod has been built around performance. I have taken great care to only use reasonably sized textured and poly count models, more so then any other modpack available, bar none. Poly count and texture size is the #1 cause of slowdown and MAF crashes (memory allocation failures), in fact the model standards for Legends of Revolution isn't that much different then BtS. In previous version of LoR there were some other attributes that would cause slow down. Mainly the betterAI component, a smarter AI has more to think about, and if the computer resources are already being overloaded, this can cause the game to stall longer in between turns. However since LoR 0.9.6, and higher, the CAR mod has been incorporated in BBAI, no significant slow down has been noted in the new versions of BBAI (testing showed somewhere around a 4% increase in turn time, which is negligible and not noticeable for humans). BUG does introduce a feature which can cause slow down: Plot List Enhancements. These can be used to more quickly gain information from unit stacks, etc. Unfortunately the code for them is all in python, and is a bit overloaded, IMHO, that said alot of people will only play with the PLE. If you are noticing slow down and reduced performance accessing the BUG options (press Ctrl + Alt + O), and disabling the Plot List Enhancements (or PLE) options will definitely improve things. Lastly because this is meant to simulate an expansion pack and has come out more then 2 years after BtS, the poly count and texture size limit is slightly larger then Stock BtS. All of these combined really don't add to much, but it is still slightly more resource intensive then Beyond the Sword is. The main ways to improve performance are to reduce your map size, or get more RAM for your computer. Q: Why does the Perfect World map script freeze, isn't this a critical bug? A: Perfect World takes about 5 minutes to generate a Standard Size map on my computer (My computer is old though, it only takes about a minute to build a Huge map on a modern computer, I think I timed it once and it took about 100 minutes to build a huge map on this old thing I use ). It basically runs a tectonics and then a meteorological simulation to generate a realistic looking map; this takes a while. My guess is it's not freezing, you're just not giving it enough time to finish. Q: Is there anyway I can help out the project? EmperorFool, Good Game, and Snarko. These three have made it possible to expand the mod beyond it's humble begginings in WolfRevolution. EF for all his help in the Python SDK forum, Good Game for making it possible to clean up the Wolfshanze high poly units, and Snarko for helping me on IRC late night when I was coding things above my level (self taught C++ and Python here). Also PieceOfMind deserves a shoutout for his Advanced Combat Modcomp, a great modcomp incorporated here (and the modcomp that actually motivated me enough to learn some C++). I also greatly appreciate the help and feedback from nudden, The Capo, Refar, Zebra9, Dresden and others for providing me with useful feedback and help essential to the building of Legends of Revolution. Moctezuma--creater or IDW, Ruff_Hi, Dale, Trojan Sheep, Solver, Dresden, Orion Veteran and others. RevDCM now tracks Fuyu's Better BUG AI as well as Jdog5000's Better BTS AI. AIAutoPlay and Revolution.py changes needed to get "Defect and Lead Rebels" and "Accept Leader Changer" Revolution events to work. Hide unsupported DCM options: DCM Attack Support only visible as a toggleable option when in debug mode. Code cleanup - Ensured values in CvDefinesModTools.h actually points to something. Code cleanup - All RevDCM GlobalDefineAlt values loaded into CvGlobals and exposed to python. Removed DCM accuracy from Horse Archers. Updated Makefile to DannyDaemonic's faster makefile. WHEOOHRN is still supposed to be shown if there are actual wars ongoing, hidden only if all there is is plans. Multiplayer mode now supported but not yet fully tested for games with more than two players. Autoplay also works in MP mode. Fixes some MP issues, MP should be playable for most players, however it still will not connect for some. Fixed ACO component. Combat modifiers now display in ACO hover display. Fixed bad path in the art defines file for the Mech infantry flanking infantry units (troopers), fixes "red blobs"
Fixed top 5 wonders/Cities screen in the Info Screen section. Built Wonder list now properly generates. To facilitate above change, Steel now requires Military Science. Cannon moved to Steel, instead of Chemistry. Removed +10% bonus to archery units for heavy footmen. 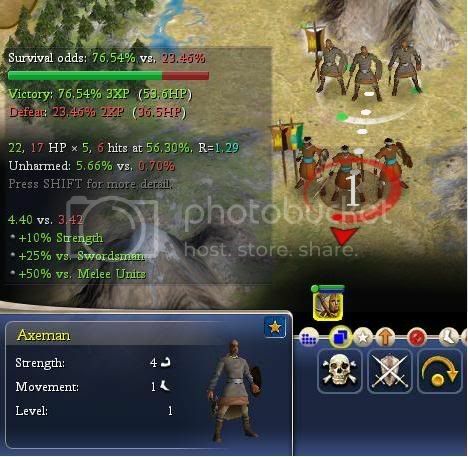 Pikeman -10% to city attack. Swapped Retreat promos on Barbary Corsairs (gets Damage Control), and 54th Infantry (recieves commando, and still gets flanking1). King's Yeomanry gets +50% strength in Forests and Hills, looses some first strikes (1-2, instead of 2-4). +100% bonus to Knights and Heavy Footman, instead of just defensive bonus. Barrage promotion line opened up to Naval Units (only effects Bismark), Bismark swaps Drill2 with Barage1 promotion. Released LoR and LoR light versions. LoR light has had all non essential parts removed, such as ethnic unit art, shrine movies, and scenarios. This is to acomodate those with low end computers and to reduce the download size for those needing it. LoR and LoR light are save game compatible, so you may swap saves for succession games or change versions with no issue. Added back default techs in BtS to Barbarians. This makes all barbarian effects much harder. Gave Barbarians a few starting techs to bring in line with Standard BtS (makes Raging Barbarians a threat again). Be aware that this makes the Barb Civs that spawn in the early game too strong, so it is strongly recommended that you do not choose the options Challenge Barbarian World with Barbarian Civ. Barbarian Civ will be tweaked for the official release to make these two options playable together, but in the current test build it is nigh impossible to deal with. Installer updated, new functionality, fixes icon scripting and other minor issues in old installer. Note: Ethnic art will be reincorporated in a 0.9.5 full release. The intent of this change is to allow a light and full version (one with ethnic art, the other without), that will be save game compatible for succesion games and what not. The light version relies entirely on BtS stock art if at all possible, the full version when released, will bring back the ethnic graphics for those that prefer those, and don't mind the increase in system demand. Added Finnish Language as a supported Language. Barb Civ City Size increased to 4 from 2 before Civilizations can emerge from barb cities. Re Wrote install script, should function much better, especially with icon scripting. 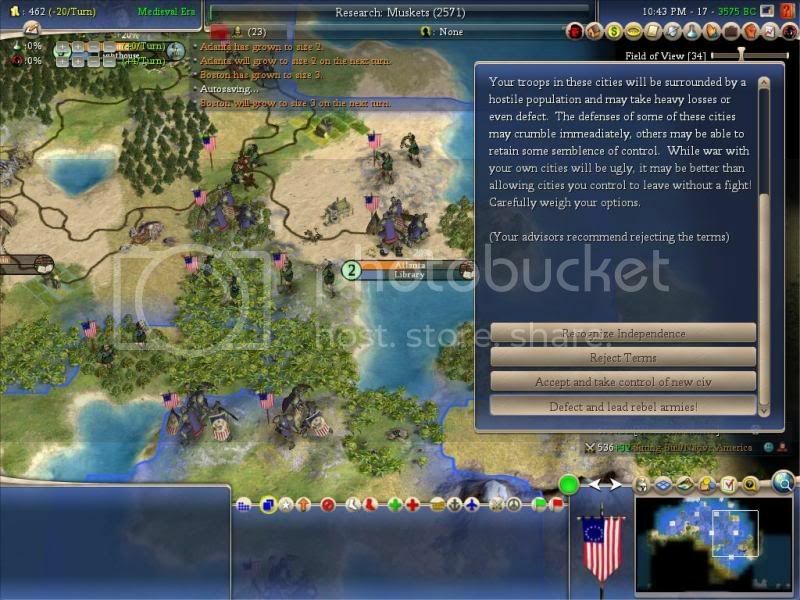 Minor tweak to Barbarian Civ component (only requires contact with 1 full civ to settle). --where it is now, but increase the need for main assault troops. *Not savegame compatible with previous builds. 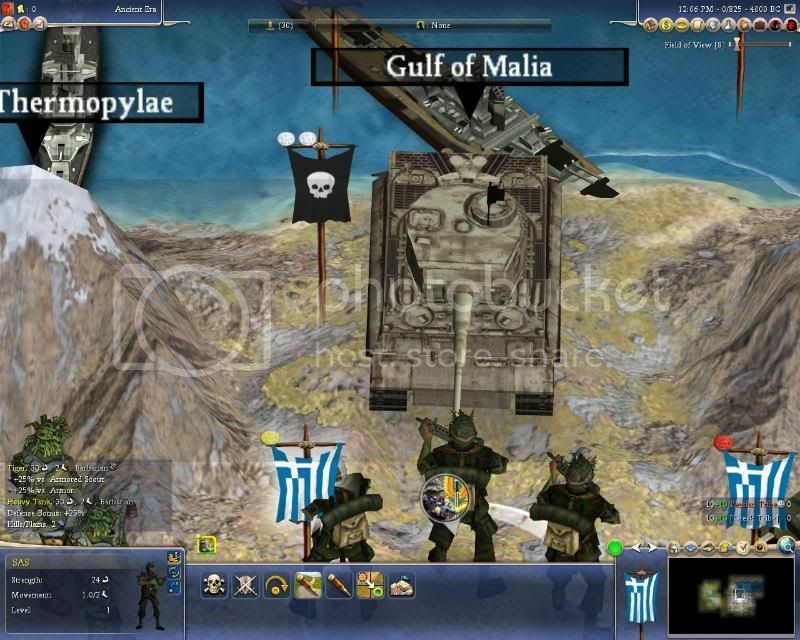 -Tweak to Promotions: Guerrilla and Woodsman promotions now gain 20/30/40 attack and defense in thier respective terrains. -Slight tweaks to a few units. -Removed Expansive's 25% culture from previous build. Settlers have now been give a flat 1 -movment. Expansive get free moral and mobility on Settlers and Recon Units. 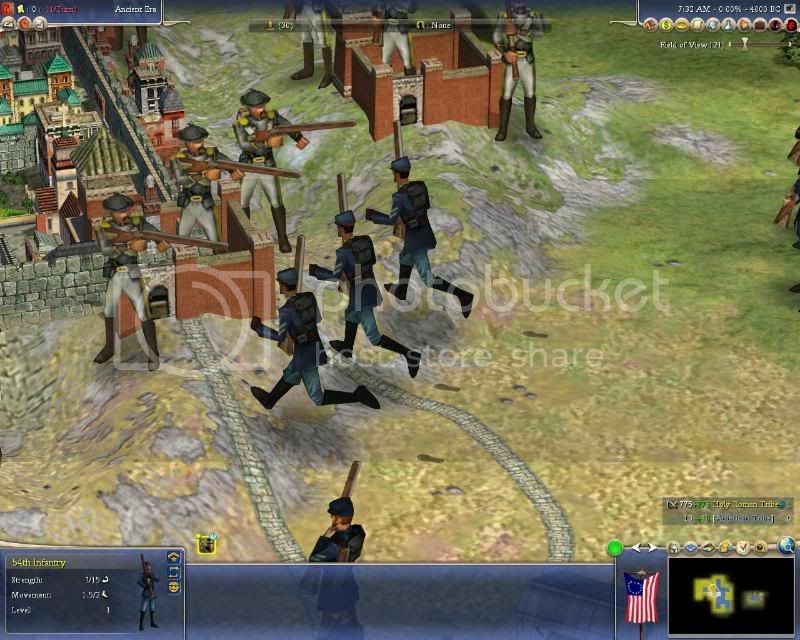 -Implemented Motorized infantry, and tweaked relevant gunpowder units accordingly. What's UXP? And is this going to be Age of Legends merged with Revolutions? Oh nom you haven't credited me for the icon . Joke . I am glad to see you announcing an official thread. I guess you're in "and others". Congrats on the new thread! 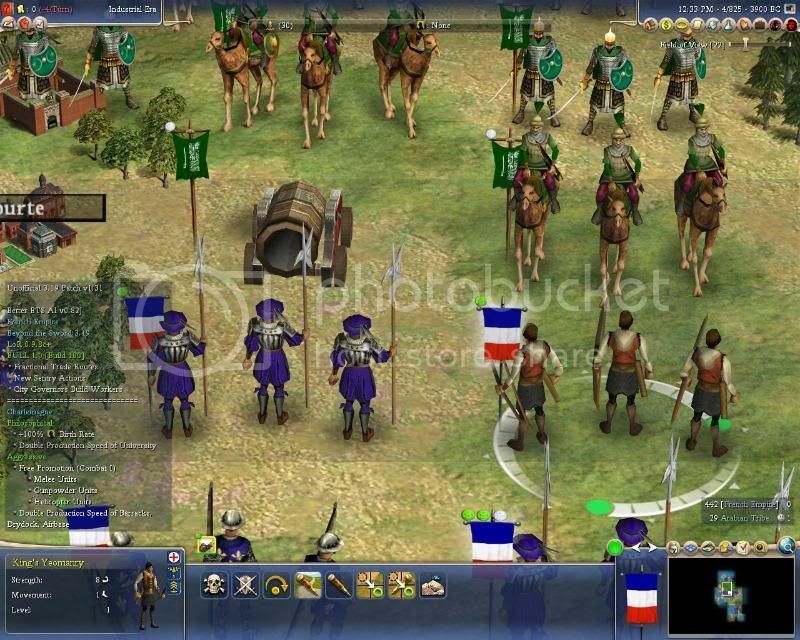 I think you should introduce the legend units as a new concept, given the mod title. Are those legend units optional, by the way? And what about DCM, that's still included (optional) too, right? I will have to try it out. When I actually play I use the Revolutions mod, but never tried the DCM, and other items. 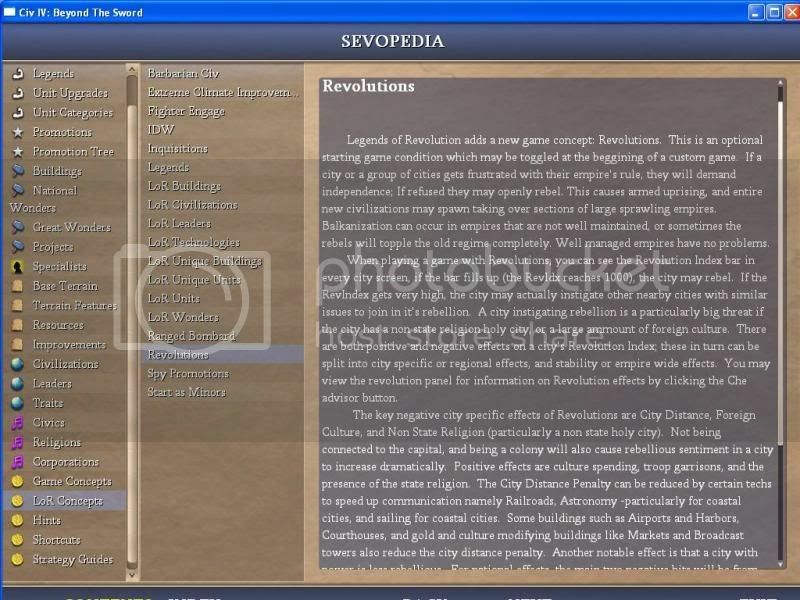 also FYI, the bug in regards to the pedia, I believe is SDK related. I was never able to jury-rig it to work correctly using python. Kael told me that the Pedia interacts with the SDK. Oh dang! Phungus has a "new" mod! I've been eagerly anticipating this sucker. Once the major issues get dealt with, I'll be in like Flynn! 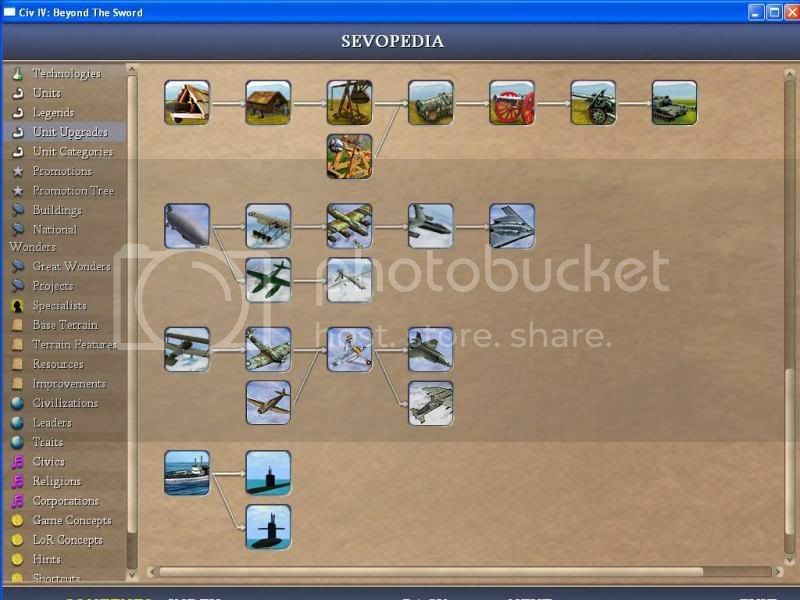 How to join the SVN beta for Realism Invictus. And here's how to get it to load in under an hour. WARNING: Takes an hour or so to do. Well, all the "major issues" I've noted are core problems with RevolutionDCM, I actually started a thread on this in the RevDCM forums because they grate me so bad. I mean they are glaring issues that stick out like a sore thumb in what is otherwise a flawless modcomp. Though the multiplayer issue isn't likely to be solved soon, as Revolutions wasn't built with multi in mind, and has to be entirely re-written according to Jdog. He's working on it, but obviously that'll take time. I really hope jdog and glider prioritize the scoreboard and stealth rev Idx issues though, the sooner these are solved the happier every Revolution mod user (which is alot when you consider all the modpacks that use it, RoM has like 30K+ downloads) will be. Anyway my point is that there is no sense in sticking with WolfRevolution and waiting on Legends to get out of beta, since in all reality Legends fixes many of the core issues in WolfRevolution (mainly insanely high poly unit models), and any issues Legends has are also found in WolfRevolution. What about a non random earth map ? With only "Revolution" and no "barbarian civ" since barbarians shouldn't only strategically placed cities ? Nice idea you think, anybody ? Also I have a possible solution for having civs going off the screen. Make it act like the start menu of windows when you hit the orb or start button ( in this case in game it will be world. Then you got to program files(would be renamed Regions) then a bunch of ways you could organize it. So insted of programs showing up you could have like Europe, Asia, North America and so on. You know how you can make all the names vanish cept' your own when you click your name in game? Actually, there's already a Scrolling-Score-List modcomp; also, using a smaller fontsize might do the trick already (used by MaxRiga in his mod). - the knights of the round table even... debatable from a historical perspective, but from a legendary perspective it would certainly be flavorful if you want to take that bent (actually, this gives me an interesting idea for a mod). Then again, some of the wonders in the game are of debatable existence (e.g. hanging gardens) so this wouldn't be a major crime either way. Obviously not a comprehensive list, but I think it gives a good idea of the kind of direction flavor-wise that I think legendary units might be more suitable as. 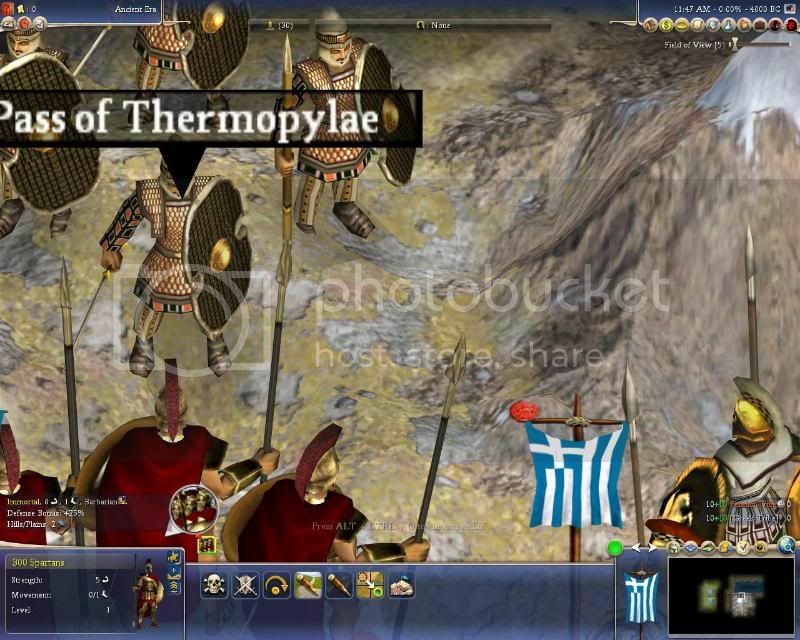 I too find it a bit too much for a serious mod to have "300 spartans" as maya. Hey LoR's got its own forum!! Phungus, Still working on the J-10A. Got it under 2000 poly but now I gota redo the skin. Several problems with it like the texture being 512x256. Anyways I should have all that fixed and uploaded later today. In the mean time, here's a whole crapload of buttons. 99% of them were just getting rid of mipmaps so that they display clearly. Only 3 of them actually got totally redone so they are all pretty much the same dds files as before with same name and everything. Quick way to check if dds is 64x64 is if it is 17kb (or 16.1kb, my computer likes to round up) except for a few promo buttons they should all conform to those numbers. Half of the unit buttons are unused art left over from wolf but they got redone any way. So now hopefully every button should have a gray frame, rounded corners and not be blurry. Oh yeah, 3rd one that got redone was Jeep. Old button was actually a Jeep cherokee or some other Jeep product. Also found a MiG-15 model for cold war/warsaw pact bloc nations. It comes in two textures, and is way below 2000 poly. Thats the only soviet jet from that era I can find.